With reference to the notes underneath, please use the table below to see the prices for curtain poles, and the calculator below for Bay window poles. Carriage charge per order to mainland UK is £12.50 (some Scottish regions will cost extra) – carriage to other destinations at cost. Please ask for a quote for Saturday and Timed deliveries. 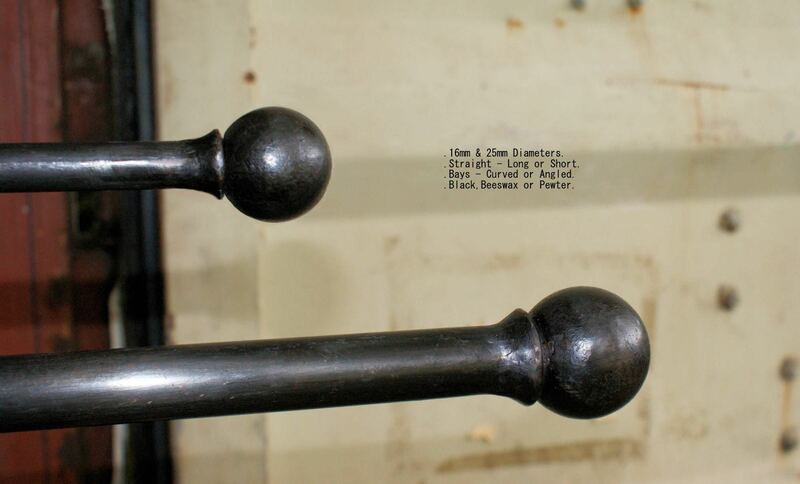 The price of a Black or Beeswax curtain pole depending on finial and overall length (including the length of the finials). Please add £10 per pole for Pewter finish. The price of a curtain pole depending on the chosen finial and overall length including the length of the finials. Curtain poles for bay window poles. All Passing rings ,4 per 30 cm of 16mm pole & 3 per 30cm for 25mm pole, and brackets are included in these prices. The Bay calculator is for use with bay windows whose walls total more than 2.1m. Smaller bays may only require 3 brackets and use standard rings so please ask for a quote rather than use the bay calculator. Remember ample rings and brackets are included with the poles but we can sell them individually too.